PLS Managing Directors Ashley Korenblat and Jason Keith discuss the cultural tourism white paper with Sen. Hatch. and his legislative director. Today, Public Land Solutions released a new white paper detailing the potential economic benefits of cultural tourism around the recently-designated Bears Ears National Monument. 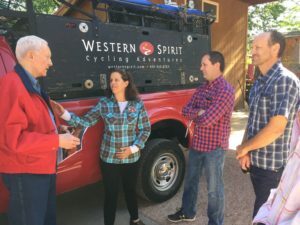 The report draws on research and case studies from other areas in the American West that have taken a pro-active approach to cultural tourism on public land as an economic driver through county and stakeholder strategic planning. The report emphasizes that in order to harness the potential of the monument and its affect on residents, San Juan County officials and stakeholders should take the opportunity not only to provide input throughout the land management planning process that will be led by the US Forest Service and the Bureau of Land Management, but should also consider developing their own complementary economic plan. This plan would focus on issues such as community zoning guidance, hotel and restaurant needs, and make recommendations on the number of visitors the communities in the region can accommodate. Within the report are several case studies of communities that have done just that. Leavenworth, Washington, is one of several examples that argue for the effectiveness of this parallel planning approach. When the railroad business left this mountainous region of central Washington, residents took advantage of the natural “Bavarian” beauty of their alpine setting to think more strategically about how to benefit from nearby public lands. And in Medora, North Dakota, residents have been promoting the 100-mile Maah Daah Hey Trail that accommodates hiking, horseback riding and mountain biking, near the adjacent Theodore Roosevelt National Park. In these cases and others, communities with strategic economic plans have seen boosts in their popularity and economic output that have contributed to long-term growth in their respective regions. San Juan County has many comparable, and in fact more advantageous, attributes that make it possible for it to follow a similar strategy: the region is deeply valued by the 5 tribes of The Bears Ears Tribal Coalition, it contains majestic canyons, rivers and mountains that provide world-class outdoor recreation opportunities, including rock climbing, hunting, hiking, backpacking, and whitewater rafting. It is also filled with abundant rock art, ancient cliff dwellings, and ceremonial sites, including The Cedar Mesa region, which holds one of the largest concentrations of preserved archaeological resources in the world.